PECOS, Texas – Trav Windham and Morg Livingston were handy cowboys working cattle ranches in west Texas. On July 4, 1883, the two joined other hands from area ranches to see who was the best, and the first rodeo competition took place on land that now houses the courthouse and law enforcement buildings. The celebration continues 130 years later with the annual West of the Pecos Rodeo, set for 8 p.m. Wednesday, June 26-Saturday, June 29, at Buck Jackson Arena. The history of rodeo dates back to 1883 in Pecos, Texas, and that tradition continues with the West of the Pecos Rodeo, which takes place June 26-29. It’s been that way for better than a century. When the first competition took place, it was supposed to be a match to test the talents of Windham and Livingston. When word spread, other cowboys helped make the world’s first rodeo. 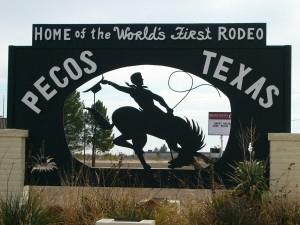 “When that day came, there were horses, wagons, people walking – coming from all directions to see what was going to happen,” said a historical tidbit on the rodeo’s website, PecosRodeo.com. It goes back to that day 13 decades ago, when Windham won steer roping by roping and tying his steer in 22 seconds, according to the historical piece. Livingston later beat Windham in a matched roping, and reports indicated that cowboys by the name of Pate Beard and Jeff Chism walked away with the honors. The West of the Pecos Rodeo has been held annually every summer since 1936 and became sanctioned by the Professional Rodeo Cowboys Association in the early 1970s. Since then, it has been recognized as one of the best events in ProRodeo and features hundreds of the top cowboys in the land. Brazile is a walking history of the sport himself. He owns a record 10 all-around gold buckles and has earned world titles in each of the events in which he competes: team roping-heading, tie-down roping and steer roping. He is just the second cowboy in ProRodeo history to have qualified for the National Finals in all four roping disciplines, including a 1998 trip to Las Vegas in team roping-heeling.